Directed by Alexander Koops, the Symphonic Band at Azusa Pacific University is an ensemble of more than 50 members dedicated to the performance of quality graded repertoire, transcriptions and new compositions. Primarily comprised of undergraduate music majors as well as students from other disciplines, the Symphonic Band allows students from other ensembles to perform on secondary instruments. Set instrumentation provides the basis for the preparation of large ensemble works for the sake of aesthetic enjoyment, musical development and collaboration with other musical groups within the university and beyond. In addition to underclassmen music majors, all students from the university community are welcome to audition for the Symphonic Band. The APU Symphony Orchestra repertoire includes a wide range of works, from Baroque to U.S. and world premieres. 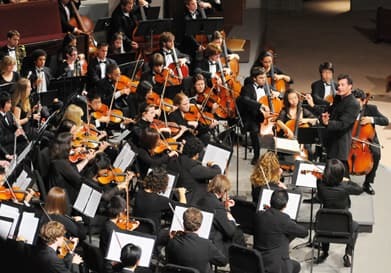 The orchestra has performed symphonies by most major composers including Haydn, Mozart, Beethoven, Schubert, Mendelssohn, Schumann, Brahms, Tchaikovsky. Dvorak, Bruckner, Mahler, Nielsen, Prokofiev, and Shostakovich. In addition to standard and new repertoire, the APU Symphony also performs little known music from the past. In recent years, they performed the world premiere of “Symphony in A” (1878) by Leopold Damrosch, the West Coast premieres of the Villa-Lobos “Bachianas Brasilieras No. 7” (1945) and Allan Pettersson’s “7th Symphony” (1968), the first U.S. performance in 60 years of Martinu’s “Intermezzo” (1950), and the first complete performance in the U.S. of a symphony by Danish composer Rued Langgaard (1893-1952). Their recording of the Damrosch Symphony and other of his works was internationally released on the UK-based label Toccata Classics in 2015. The APU Symphony Orchestra is only the second U.S.-based orchestra to appear on the label. 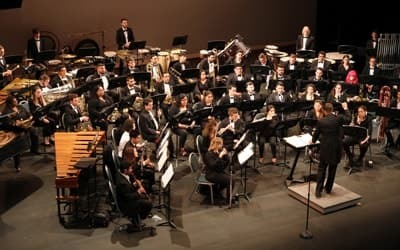 Led by John Burdett, director of bands and instrumental studies, the Wind Ensemble is the premiere winds, brass, and percussion ensemble in the Azusa Pacific University School of Music. For nearly two decades, the bands at Azusa Pacific University have been an important part of the development of the wind band community while providing experiences that development its members’ musicianship. 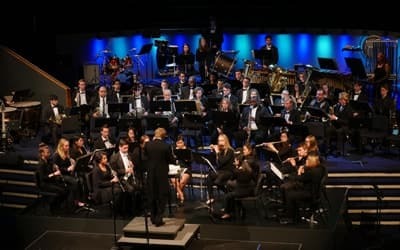 The Wind Ensemble has performed commissions from notable composers, including Bill Connor and John Mackey, and have hosted prominent guest conductors, including Eric Whitacre and Frank Ticheli. Their current project: recording choral compositions set for wind band by Sir John Rutter, Z. Randall Stroope, and Kevin Memley, is being used by music publishers such as TRN and Imagine Publishing as source recordings for conductors and teachers throughout the world. Selected by audition only, the Wind Ensemble consists of approximately 55 of the most exceptional graduate students and high achieving undergraduates within the School of Music. In addition to being led by Burdett, the graduate conducting associates pursuing their Master of Music in Instrumental Conducting often lead the Wind Ensemble in performing repertoire of traditional wind band masterworks and dynamic new compositions. Alumni of the Wind Ensemble have gone on to successful careers and further graduate study in the wind band community, music education, music industry, and music profession at large through, teaching, conducting, composing, and performing. 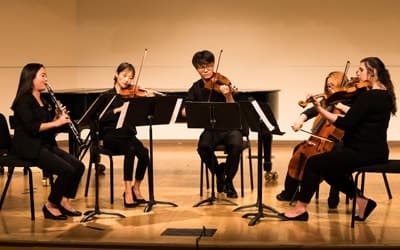 APU School of Music students learn to perform chamber music in ensembles as an essential step to becoming well-rounded musicians. Chamber ensembles in various instrumentation, such as piano trios, wind quintets, brass quintets, and string quartets, study standard chamber music repertoire in rehearsals and weekly coaching sessions. Student musicians collaborate on developing interpretations of these great works under the direction of their faculty coaches and under the leadership of Director of Chamber Music Marek Szpakiewicz. Although the guitar is unquestionably the most-used instrument in today’s commercial music ensembles, the role of the guitarist can vary. 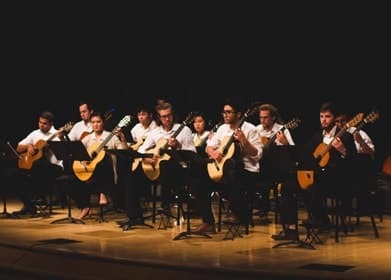 The APU Guitar Ensemble is a combination of undergraduate, graduate, and artist certificate students who perform classical and commercial literature in a format that holds each section responsible for reading specific parts on various areas of the fingerboard. The levels of musicianship and knowledge of the fingerboard gained in this ensemble provide skill sets required for professionalism in the future, regardless of style. It also presents an opportunity for young composers and arrangers to write guitar-specific works to be performed. The size of the ensemble can vary from an entire guitar orchestra to trio or quartet arrangements for smaller groups. The guitar ensemble is led by associate professor Michael Kozubek, M.M. Consisting of 8-12 players, this elite group of concert percussionists prepare and perform the ever-expanding repertoire of chamber works composed and arranged solely for percussion instruments. 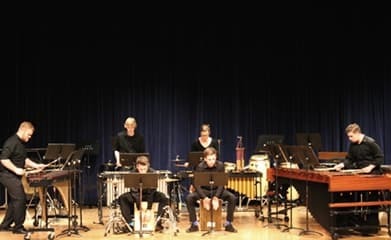 Directed by Bill Schlitt, the percussion ensemble is an invaluable aspect of musical preparation for its members as they move on to graduate schools and professional work. 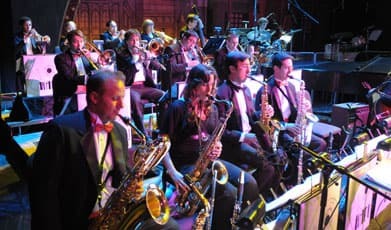 The Azusa Pacific University Jazz Ensemble, directed by David Beatty, holds a reputation of professional-level performance and mastery in a broad spectrum of big band jazz styles. As one of the premiere instrumental ensembles at APU, the Jazz Ensemble keeps a busy schedule of performances that have including award-winning appearances at The Monterey Next Generation Jazz Festival and the Reno International Jazz Festival. Taking advantage of the proximity of Los Angeles the group often performs commissioned works by some of the best known composers in Hollywood, and can frequently be found in the studio, recording for some of those same composers. Placement in this group is by audition only. 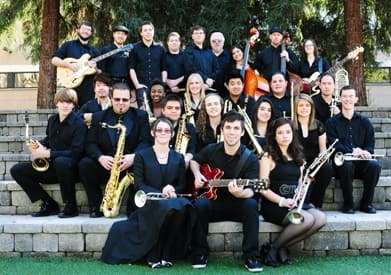 The Jazz Workshop, directed by Richard Carey, is APU’s second jazz big band and provides students an opportunity to gain more experience in jazz performance, improvisation, and big-band literature, both new and old. Along with this and the Jazz Ensemble, the School of Music sponsors several jazz combos each year that offer a more focused jazz improvisation environment and valuable small-group experience. Participation in Jazz Workshop and jazz combos involves frequent off-campus performance opportunities throughout the year. The APU Studio Orchestra prepares students to successfully engage in the multifaceted studio and live performance environments of working professional musicians, equipping them with the broad palette of skills required of today’s professional instrumental performers. The Studio Orchestra is directed by Mark Gasbarro, and entrance in the group is gained by audition only.